HR recruiters and interviewers have entered lots of data about their candidates into their recruiting app. But for that review data to be useful, they need it calculated and scored. Use rollup summary fields and formulas to accomplish this. A rollup summary is kind of the reverse of a cross-object formula (which you created in the first step of this project). Instead of getting data from a parent (or grandparent) object, it gets data from records on a child object and stores that data—results are recalculated and stored whenever any record on the detail record is saved. Formula fields take input from other fields, values, functions, and operators to produce results. They can reference standard fields, custom fields, and other formula fields. Formula results are not stored—the formula expression is stored as metadata. But the result of that expression is calculated on the fly whenever a user views a record or runs a report containing the formula field. Create a custom formula field that calculates the overall score from the Review object. From Setup, click Object Manager, and select Review. Select Formula as the Data Type, and click Next. For Field Label, enter Overall Review Score. For Formula Return Type, choose Number. Click Check Syntax to verify that there are no errors. Click Next, Next, then Save. Now, create a rollup summary field for Number of Reviews on the Job Application object. From Setup, click Object Manager, and select Job Application. For Data Type, choose Roll-Up Summary, and click Next. For Field Label, enter Number of Reviews. Select Reviews from the Summarized Object picklist. Select Count as the Roll-Up Type. Select All records should be included in the calculation as the Filter Criteria. Click Next, Next, then Save & New. Next, create a roll-up summary field for Review Scores on the Job Application object. Select Roll-Up Summary as the Data Type, and click Next. For Field Label, enter Total Review Score. Select Sum as the Roll-Up Type. Select Overall Review Score as Field to Aggregate. Now create a formula field that calculates the Average Review Score for a job application. For Field Label, enter Average Review Score. Select Number as the Formula Return Type. Ensure your screen looks like this. Click Check Syntax to verify there are no errors. Create a formula field to show a green, yellow, or red light on a job application record, depending on the Average Review Score. For Field Label, enter Review Indicator. 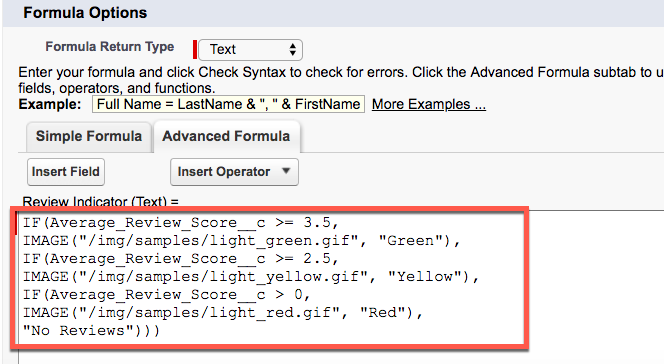 Select Text as the Formula Return Type. Now move the new fields to a Candidate Rating Section on the Job Application page layout. While still viewing the Job Application in Object Manager, click Page Layouts on the left navigation bar. Click next to Job Application Layout, and select Edit. Add a new section to the page layout, by dragging Section from the palette to below the information section. For Section Name, enter Candidate Rating. Drag the Number of Reviews, Total Review Score, Average Review Score, and Review Indicator fields from the Information section into the Candidate Rating section..
By customizing page layouts and creating cross-object formulas, validation rules, roll-up summaries, and formulas, you're giving the HR team more bang for their buck with their recruiting app. With consistent, complete data they can easily utilize and find at a glance, they can add new talent to AW Computing faster than ever.